This Bird’s Eye Chilli is super pungent. We love growing them at our backyard in order to provide us with a continuous supply for our various dishes. Best of all, the pods are pesticide-free and great for our health! 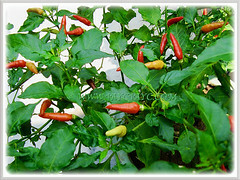 Common Names: Chilli Padi, Bird Chilli, Bird’s Eye, Tabasco Pepper, Red Pepper, Bird Pepper, Thai Chili, Chabai (in Bahasa Malaysia). Etymology: The genus name Capsicum is derived from the Latin word capsa referring to the pods. The specific epithet frutescens means bushy or shrubby. Origin: Native to Mexico, Central America and South America. It is popularly cultivated worldwide. Plant type: An ornamental and perennial shrub. 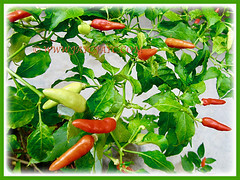 Features: Capsicum frutescens cv. Bird’s Eye is from the genus, Capsicum that consists of about 20-27 species of perennial shrubs. 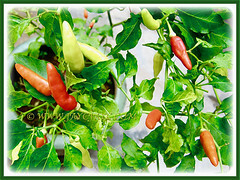 Bird’s Eye Chilli is a popular cultivar. A tropical plant with a fast-growing rate. This upright growing perennial can easily reach up to 2 m tall and is supported by a short to long taproot with many spreading lateral roots and fibrous roots. The green stem of mature plants are woody but moderately soft and weak. Older branches are light gray. Its leaves are simple, smooth, glossy, leathery and petioled. They are alternately arranged along the stems. Each green leaf measures between 3-8 cm by 2-4 cm. The hermaphrodite flowers are greenish-white with blue or yellow anthers and occur in groups of two or more at the nodes. The common features of frutescens cultivars are their greenish flowers and their steeply upwards direction pedicles. Numerous upward-pointing conical fruits are produced. 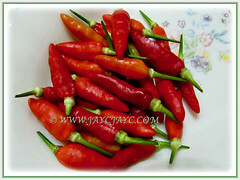 The colour of the chillies range from green to yellow, orange and then red at maturity. The colour of the seeds is cream to off-white and smooth with seeds per fruit between 10-20. 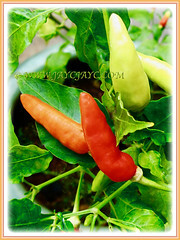 Culture (Care): Capsicum frutescens cv. 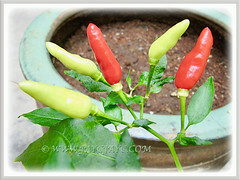 Bird’s Eye or Chilli Padi can be easily grown with minimum care. Soil: Best in humus-enriched, loamy and well-drained soils. Not particular as any commercial soil is fine. Others: Prune the plant when necessary to control its size, stimulate strong new growth and encourage production of abundant chillies. Take note that the juice of the fruit can cause dermatitis. Thus, avoid contact with your eyes. Generally free from serious pests and disease problems. Nevertheless, watch out mealybugs, aphids and nematodes. Capsicum frutescens cv. Bird’s Eye is sensitive to frost. 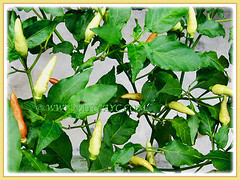 Ideal to grow these peppers at a sunny location and they do enjoy a humid environment. The flowers can self-pollinate. However, at extremely high temperatures of 33-38°C, the pollen loses viability and flowers are much less likely to pollinate successfully. Tabasco Pepper matures and fruit very quickly in abundance with proper growing conditions. In non-hardy regions, grow the plant in a container and bring to overwinter indoors in the greenhouse as a houseplant. Usage: Capsicum frutescens cv. 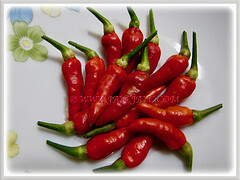 Bird’s Eye or Chilli Padi is popularly grown for its edible and ornamental fruits. It is frequently used in Asian cuisines. Can be eaten fresh, dried, ripe or unripe, cooked or raw as a herb and spice. Ideal to be grown in a flowerbed and garden border. Suitable for container gardening, both outdoors and indoors. It has medicinal properties and often used as a salve to relieve muscle, joint, toothache, etc. Use Chilli Padi as an insect repellent. 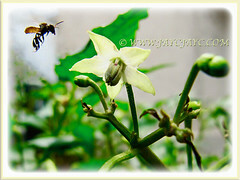 The plant attracts birds and honey bees.